Love to drape a full nine yard? 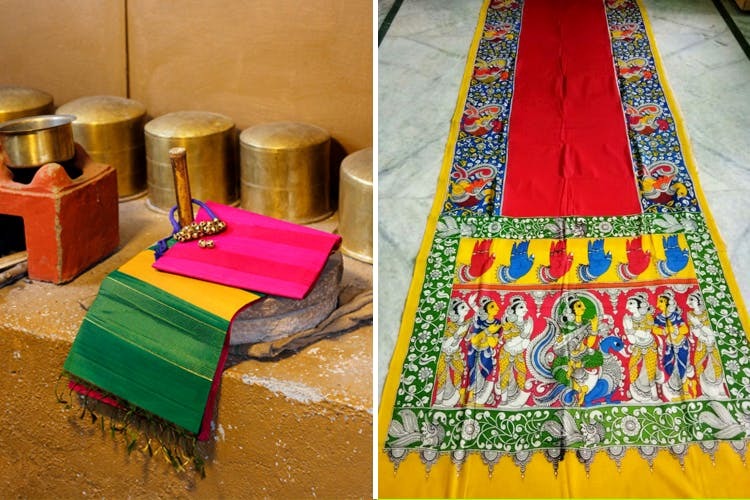 Buy intricately printed sarees in ikat, Kanjeewaram and more, from Jaanhvi’s Closet in Pune. Started by an IT professional, Sethulakshmi Mohan is a pro when it comes to designing artistic sarees. From pure silk to ikat, kantha, kalamkari, Kanjeewaram and handwoven pure cotton drapes, the impeccable collection at Jaanhvi’s Closet has been collected and selected from varied parts of the country. Sethulakshmi operates from her house in Wakad and also brings her variety of sarees out to a number of flea markets happening all year round in the city, including Wassup, Za Palooza and more. She says that the reason her gorgeous sarees are easy on the pockets are because she gets them directly from the manufacturers and hand weavers. Priced between INR 900 and INR 10,000, every saree at Jaanhvi’s has a tale to tell. They are unique, well-crafted and elegant to the core. Through Jaanhvi’s Closet, Sethulakshmi Mohan also carries out bridal consultations which means that a would be bride can customise her own Kanjiwaram sarees! Doll up in handwoven silk and cotton sarees from Jaahnvi’s Closet and make heads turn.